Old Navy has teamed up with Kristen Bell on its Back to School campaign which includes a capsule collection for its ONward! cause platform and the chance to win a shopping trip with the actress in LA through an online sweepstakes raising money in support of the brand's charitable partner the Boys & Girls Clubs. [post_ads]The ONward! 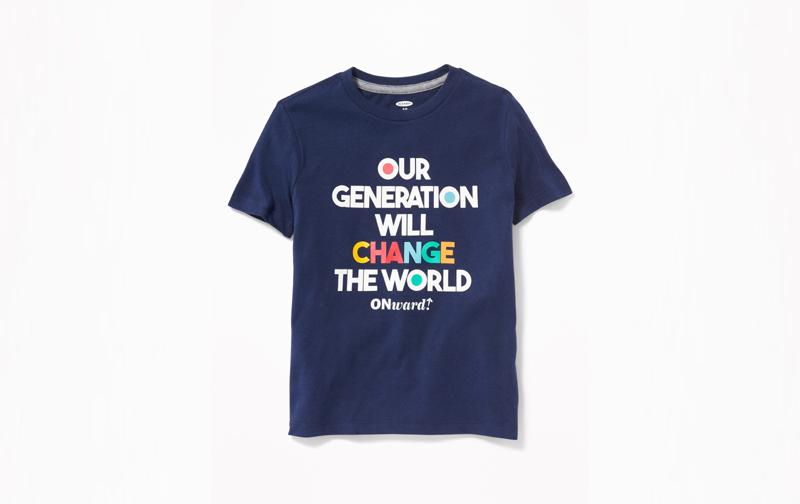 capsule collection includes tees and hoodies for boys and girls channeling the message of the platform, which aims to empower the next generation through partnerships with nonprofits offering training programs and job opportunities. Accessories including water bottles and tote bags are printed with the collection message "our generation will change the world." As part of its charitable efforts, Old Navy will also make a $50,000 donation to the Boys & Girls Clubs in honor of the capsule. The Back to School sweepstakes campaign features Bell singing a song with lyrics created from interviews from Boys & Girls Club kids. The actress will also be sharing her own past Back to School looks as prepares to style the sweepstakes winner. “Heading back to school each year is an unforgettable moment in every child’s life,” said Kristen Bell, adding that she looks forward to helping the winner "look and feel their best, so they can start the school year with a sense of confidence and empowerment." One winner and their guest will fly to LA for a $1,000 shopping spree at Old Navy. The winner will also have a singalong session with Bell. As well as the online sweepstakes, customers can also engage with Old Navy's charitable commitment to the Boys & Girls Club in store. From July 26 to August 8, the Gap Inc.-owned company will match customer donations to the organization in an amount up to $300,000, with a goal of raising $1 million this fall. Graphic tees and hoodies from the Onward capsule are priced at $11 and $25, respectively. The collection will be available in Old Navy stores in the US, Canada and online.